Right after Lex and I moved in together 18 months ago, I bought a magnetic dry erase board to hang on our refrigerator for the purpose of keeping track of the groceries we needed. It has worked quite well for the purpose for which it was intended. Additionally, it has served to be useful for other purposes. Like when we have to keep score for how many times Lex spits razzberries at me in contrast to how often I deliberately annoy him. People cannot resist the lure of a blank white space...especially when a marker is so handily ready to be used to deface said white space. Occasionally, we get artwork - little pictures of fairies or monsters or hobbits. Mostly though? 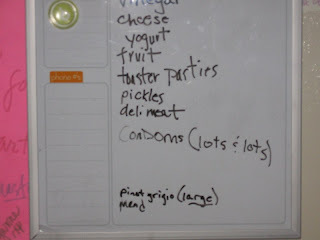 We get random, typically sexually-related, items added to our ongoing list. I'm fairly certain all the people we know and entertain have the maturity level of 12-year-old boys...including ourselves. Normally I'm pretty savvy at catching the additions when I'm making my shopping list. There was that one time I did buy D batteries for Lex without question. You know, because in this house we have an if-you-don't-want-to-know-just-don't-ask policy and I just didn't want to know. He was more than a little surprised when the batteries appeared in his room after my weekly shopping trip. I was more than a little surprised I'd been so gullible. Recently, a mysterious item showed up on the list during a night of RPG geekery. It wasn't very subtle so I knew right away it was one of our friendly pranksters. But when Lex and I were making my shopping list that week, given the fact that he and I both have been dating more during the last couple of months, we looked at that item and decided in all seriousness it was both practical and prudent. Quite right, you just can't have safe dating fun with out lots and lots of deli meat and toaster pastries I always say! It actually says "pasties" which makes it even more fun. Personally, give us all enough of the (large) bottle of the pinot grigio and this becomes a really fun list.